I guess you all already know the Sandman eps are my favorites. One thing I haven't mentioned about them: Is it me or is the color saturation (especially reds and greens) turned way up on these two? Flesh tones run very pink and Robin's tunic is practically neon at times. As Sandman leaves Catwoman's lair for the last time, for a few seconds he's a solid blob of green! I really hope they look better than that on the DVD. One more thing I spotted for the first time: Sandman uses a different (or modified) stethoscope; when he first takes it out of his bag, the diaphragm is flat and solid; when he's taking photos with it there's a lens on the diaphragm. 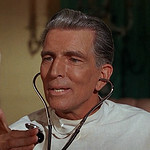 Still wish I could find out (a) how the gas part of the prop stethoscope worked and (b) what were all those things inside his fur coat? Were they used in the original script? I'm sure that BATMAN fans in the Philadelphia area have discovered that our local Me-TV affiliate, in what seems to be an on-going campaign to undermine the network, has replaced BATMAN with two locally-produced current affairs programs. This follows on the heels of their replacing KOJAK with a locally-produced "talent" show and the early morning programming block with the dreaded infomercials. ME-TV New York has morning infomercials.Batman is still on here. Leslie Parrish, who played GlaciaGlaze/Emma Strunk in last night's Mr. Freeze eps, shares a distinction with Diane McBain: both played a villainous moll in one ep, and a "good girl" in another. Leslie was breathless actress Dawn Robbins in the first Penguin appearance the year before. Perhaps not surprisingly, both were Deb Stars in 1959, along with Yvette Mimieux, Shirley Knight and fellow Batman moll Sherry Jackson, among others. LittleLouisGroovy wrote: I'm sure that BATMAN fans in the Philadelphia area have discovered that our local Me-TV affiliate, in what seems to be an on-going campaign to undermine the network, has replaced BATMAN with two locally-produced current affairs programs. This follows on the heels of their replacing KOJAK with a locally-produced "talent" show and the early morning programming block with the dreaded infomercials. Unbelievable. I just looked up their website. Wilmington, DE—Award winning Philadelphia journalist Larry Mendte joins Me-TV affiliate KJWP Channel 2 as public affairs director. Mendte will host two programs, The Delaware Way, and then…And Another Thing with Larry Mendte. The programs will air back-to-back every Saturday starting at 7pm and then re-air on Sunday morning at 9am. They have two sub channels also, but guess what's on them? The rainbow test pattern/station ID. I mean geez, why have sub channels if you aren't going to broadcast on them? My niece and I are BIG Bat-Fans, and were big fans of ME-TV. I posted on Mr. Mendte's Facebook site, and he claims that this is what ME-TV gave them time-slot wise for their FCC mandated pubic affairs programming. He suggested take it up w/ ME-TV, which I did but have received no reply. The local affiliate was very quick about returning my telephone and e-mail messages, very polite but also claim their hands tied by ME-TV. Quick!! Someone write to Svengoolie! Better yet, Philly area Bat-Fans make a post on ME-TV's FB site! I too was pleased that IFC is running the show, and this always seems to be the case, TV Land had it for a while, and we either lost the cable carrier (I forget) or something else brought our beloved heros to a early demise!! Guess what's on my Xmas list?? richey88 wrote: My niece and I are BIG Bat-Fans, and were big fans of ME-TV. I posted on Mr. Mendte's Facebook site, and he claims that this is what ME-TV gave them time-slot wise for their FCC mandated pubic affairs programming. He suggested take it up w/ ME-TV, which I did but have received no reply. The local affiliate was very quick about returning my telephone and e-mail messages, very polite but also claim their hands tied by ME-TV. Quick!! Someone write to Svengoolie! Better yet, Philly area Bat-Fans make a post on ME-TV's FB site! I don't have Facebook, or I'd make a post. Anybody out there want to pretend they're in Philly and do it for me? It looked like they were rerunning the same public affairs programming on Sunday mornings, so why do they have to mess with the Saturday night block? I was just made aware of the situation with Batman on Me-TV Philadelphia and am " holding my breath for the Dynamic Duo" as we are slated to receive Me-TV New York by month's end on a new (to us) broadcast station KVNV, assigned to Middletown, NJ, but broadcasting from NYC. Both the Philly and NY affiliates are owned by the same company, so as a classic TV fanatic, I'm bracing to see how many of my favorites are going to be surrendered to endless pitches for hair loss solutions, exercise products, or Time Life collections. As for the public affairs shows, they are FCC mandated, as are a block of children's programs that carry educational value. This is what the stations used to call "serving the public interest as a public trustee" when they aired license renewal notices. Hope you Philly viewers get Batman back. I watched him on WTAF (ch. 29) back in the day. Since the public affairs shows are FCC mandated, then why isn't it affecting Batman in every city at that 7 P.M. hour? I know Andy Fish had this problem in Boston, but he eventually got Batman back, IIRC. And if they're also showing the Larry Mendte stuff on Sunday mornings, shouldn't that satisfy the FCC? Plus, isn't the Larry Mendte stuff all about Delaware? The majority of viewers in this market don't live in Delaware. (Yes, I know the station is listed as Wilmington/Philadelphia.) It's just maddening that it is affecting the one show I wanted to watch on their station, and it isn't affecting (most?) other stations in other markets. 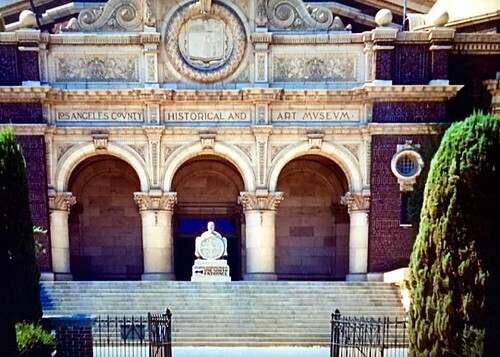 "The Ogg Couple" episode also features this museum - and its old "Los Angeles County" signage is now fully visible on the Blu-Rays!